Director of Operations Jeff Peterson discusses new school maintenance issues with Moffat Schools Program Developer Virginia Drake. Last Tuesday, Director of Student Support Services Paula Buser, Fremont County Regional Health and Wellness Coordinate Brian VanIwarden, Social-Emotional Learning Coordinator Jamie Murray, and I met with Cañon City Police Department with a focus on how we can all support the social-emotional learning of our students. We discussed how we can team up to provide support for all kinds of kids through our social-emotional wellness initiative, how this work blends into our Multi-Tiered Systems of Support, how this supports our core belief that we attend to Maslow's Hierarchy of Needs before Bloom's Taxonomy, and how the police department can engage both highly motivated and supported as well as at-risk kids. I just can't say how excited I am to work with a police department that clearly sees the value in this type of work! I want to thank Cañon City High School Principal BillSummers and Director of Technology Shaun Kohl for the fine teamwork they displayed creating a two-page Chromebook student and parent responsibility policy. High school staff has already been having parents sign this policy as registration is taking place. I know this was not an easy task and I appreciate their effort. On Thursday Director of Operations Jeff Peterson and I took a tour of several recently built San Luis Valley schools so Jeff could benefit from the experience of district personnel who have been learning how to maintain newly built facilities. I was quite impressed by how willing Jeff was to learn. He asked many questions about the challenges each district faces in maintaining their new buildings, and the decisions they would have made differently if they had the opportunity for a do-over. This experience will be of great benefit to CCSD as we start our design process. I want to thank Center Schools Director of Operations Rich Brandt, Sangre De Cristo Superintendent of Schools Brady Stagner, and Moffat Schools Program Developer Virginia Drake for dedicating their precious time to our effort. A highlight of our annual All-Staff Gathering is the Cañon City JROTC Color Guard presentation of colors. I'm excitedly preparing for our upcoming all-staff back to school gathering that takes place on Tuesday, August 14th beginning at 8 AM in the Lou Del Pizzo Auditorium at Cañon City High School. Assistant Superintendent Adam Hartman, Board Director Shad Johnson, and I are working together to craft a keynote presentation that will introduce our newly adopted core beliefs and the process by which we'll revisit our district vision and mission. I enjoyed meeting with new RE-2 superintendent Brenda Krage last week over a cup of coffee at The Pour House in Florence. Brenda's statewide reputation is impeccable and I look forward to expanding collaboration efforts between our school districts under her leadership. Last Wednesday we held a very productive meeting with district and high school office staff about how we'll assign students to courses when they participate in online, alternative, and blended learning classwork. We're doing this work to ensure we meet all Colorado Department of Education requirements for pupil funding, attendance, and course classification, especially in light of our move to offering more blended learning opportunities at the high school level. 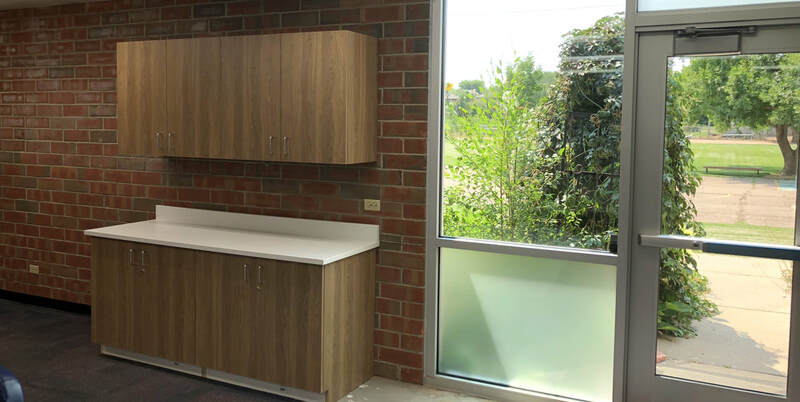 Newly installed cabinetry, windows, and doors are looking great at Lincoln School of Science and Technology. Summer construction work continues. Water lines are now operable and classroom cabinetry has been replaced at Lincoln and McKinley, allowing our operations crew to begin carpet installation-replacement. Window installation is progressing at all impacted sites with the installation of operable windows being our remaining task. Work on secure entries continues at CES, CCHS, Harrison, Lincoln, and McKinley. It still looks like they will all be ready in time for the first day of students. On Monday I caught up on email and published an edition of Echoes while on the road back from a family wedding in Tucson. On Tuesday I attended a monthly Cañon City Police Department touching base meeting, Superintendent’s Advisory Council, and our weekly Design-Build team meeting. During the rest of the week I attended a Fremont Facilities Corporation meeting, met with new RE-2 Superintendent of Schools Brenda Krage, attended various meetings related to students and staff, and toured several recently built San Luis Valley schools in preparation for our new school design process. While touring the recently built Sangre De Cristo school in Mosca, Colorado, Director of Operations Jeff Peterson and I discovered a certain high school counselor who wore the number 42 was a key player on back-to-back state championship teams. During our annual administrator retreat, Director of Special Services Tim Renn shares his thoughts on the development of a stronger Multi-Tiered System of Support (MTSS) process across the district. On Monday we have our annual administrator retreat, on Tuesday we kick off our annual new certified staff training process and I'll attend our weekly Design-Build team meeting, and on Wednesday we'll hold our first monthly district leadership meeting. On Tuesday afternoon I'll also travel to Denver for a Colorado Safe Schools Resource Center advisory board meeting. I also have a slew of routine meetings such as SAC, classified leadership, and a follow-up student expulsion meeting.